JV baseball swept John Glenn yesterday. Logan Drogowski got the win on the mound. CJ Alvarado had two RBI's. Varsity baseball had a shutout against John Glenn yesterday! Kyler Warren got the win on the mound and Jayden Johnson had the save while also having two hits on the day! Congratulations to the girls tennis team as they crushed New Boston Huron yesterday at home. The player of the game was team captain Bailey Etherton, whose powerful serves helped lead her to a 3 set win at number 1 singles. Come support the team on Tuesday when they take on John Glenn at 4:00. Rachelle Frederick pitches a Shut Out against John Glenn last night with a score of 19 – 0. Great job Lady Tigers! Last night the Varsity Girl's Soccer Team traveled to Dearborn and lost by a score of 6-1. Bella Sylvestre scored the only goal for the Tigers, whose next game is tomorrow at home versus Wayne Memorial. Varsity Softball wins big 16 – 3 against John Glenn last night. Haley Bellingham pitched the winning game, surrendering three runs on four hits over four innings, striking out seven. Mikalya Demyan had the only home run of the night and Cassidy Brendtke drove in five on two hits. Great job Tigers! Girls JV tennis crushed New Boston Huron yesterday! The final score was 7-1. Number two and three singles players Sydni Flint and Zoie Sawdy both won 8-0, and set the tone for the rest of the matches. Come support your JV girls tennis team this Thursday when they face Franklin High! Belleville Lacrosse achieved its first win of the season in a 12-4 victory over Ann Arbor Huron on Friday. Nate Lazar had 4 goals, Darren Barber scored 3, Caden Courter & Ben Jeng scored twice each, and Nick Bradford had one goal. Congratulations Tigers! Congratulations to Kayla Hamilton with her solo home run Friday night. The Tigers fell behind early and couldn't come back in a 9-2 loss to Plymouth. Last night the Girls Varsity Soccer team hosted John Glenn in a match that ended in a 0-0 tie. Jordan Kelly had her second consecutive shutout for the Tigers, who saw their league record fall to 1 win, 1 loss and 2 ties. The JV girls soccer team posted their 2nd shutout in a row with another 8 - 0 win last night. John Glen had 2 shots on goal due to our stellar defensive line of Ryane Ward, Emily Wisniewski, Olivia Ehnis and Jackie Torres. Goalie Gabby Revel having her 3rd clean sheet of the year. Goals were scored by Helina Belay, Aaliyah Wilkerson and Emily Michelin. Breanna McCluskey had the hat trick. The final goal came from a 30 yard direct kick by Derricka McCarter. The Varsity and JV Lacrosse teams had tough losses to Plymouth last night. Darren Barber and Kyle Mikulski each scored in the Varsity game. Devin Wisniewski scored in the JV game. JV girls tennis played a tough match against Divine Child yesterday afternoon. Freshman Meghan Sawdy and sophomore Lauren McKnight both won in two tough singles matches. Come support the JV girls tennis team in their next home match this Friday! Varsity Softball gets a win over Franklin. Rachelle Frederick threw a shutout to lead the Tigers past Livonia Franklin 1-0 on Monday. Alyssa McClendon grounded out, scoring one run. JV girls soccer won their 3rd game yesterday with a 8 - 0 victory against Fordson. The goal scoring was as follows: Emily Michelin and one of our team Captains, Elly Mann each had two goals. Aaliyah Wilkerson, Helina Belay and Breanna McCluskey each had 1 goal. The final goal to close out the game, came from Ryane Ward 45 seconds into the 2nd half. Varsity Lacrosse opened the 2019 season against Grosse Pointe South yesterday. Five goals from Darren Barber, 4 goals from Caden Courter, 2 goals each from Nate Lazar, Ben Jeng, Nick Bradford, and 1 from Jack Foster were not enough in a tough 16-17 OT loss to Grosse Point South. Our JV girls soccer team lost, falling to Stevenson 2 – 0 yesterday. Despite excellent scoring opportunities from Elly Mann, Derricka McCarter and Breanna Walker, the team couldn't close the gap. The team effort, endurance and conditioning helped keep us competitive throughout the game. 27 BHS student are headed to Europe today! Varsity Softball Claws Back, but Falls Just Short Against Livonia Stevenson last night with a score of 8 - 6. Our JV girls soccer team won their 2nd consecutive game in a row last night. The 2 - 1 victory was highlighted with both goals coming from Breanna McCluskey, with assists from Soraya Taylor and Elly Mann. "We played with intelligence and tenacity. Our persistence on offense finally paid off in the second half with 2 goals." Coach Joe stated. "We take on Livonia Stevenson Thursday night. Yesterday varsity baseball won their season opener against Livonia Stevenson. The score was 1 - 0 with Barry Butler pitching six innings allowing only one hit and fellow Senior Andrew Leamy finishing the Spartans off and completing the shutout. Nate Boyar lead our bats by going 2 for 3 from the plate, but the play of the game came from sophomore Kyler Warren with a walk off single to seal the deal. Great game tigers! Last night the Varsity Girls Soccer Team opened its league season with a 2-2 tie versus Livonia Churchill. Bella Sylvestre and Olivia Newman scored for the Tigers, who play again tomorrow night at 7 pm at Livonia Stevenson. Last night the Varsity Girl's soccer team opened their season on the road with a loss to a strong Plymouth High School team by a score of 6-2. Lauren Marshall scored both goals for the Tigers, who played well in spite of the final result. The team plays their first league game at home on Friday at 5:30 against Livonia Churchill. Our JV girls soccer team lost their opening game of the 2019 season against Plymouth yesterday. Despite the loss, our goalie Gabby Revel, had an outstanding 93% save percentage during the battle. Congratulations to our newest freshmen team members on their inaugural High School soccer match: Derricka McCarter, Breanna McClusky, Emily Michelin, Rachel Sentowski, Jaqueline Torres, Ryane Ward, Aaliyah Wilkerson, Emily Wisniewski & Gabby Revel. "We had an excellent game, we'll regroup, focus on our challenges and come out stronger for our next game this Friday versus Livonia Churchill". Coach Joe assured the team. The Junior Class is sponsoring Belleville's Got Talent on Weds., March 20 at 7 p.m. in the BHS auditorium. Come out to support talented BHS students! Admission is $5 per person, and all the proceeds benefit the class of 2020. BHS is hosting a band festival. Congratulations Symphony Band on your impressive performance! Jazz Band Spaghetti Dinner...Great food, great music!!! Doors close at 8:00 p.m.
Congratulations to State Qualifier in Bowling, Katherine Dybicki! Good Luck Saturday at Thunderbowl Lanes! Congratulations to Individual State Qualifiers in Wrestling, Jaden Rice and Blake Williams! 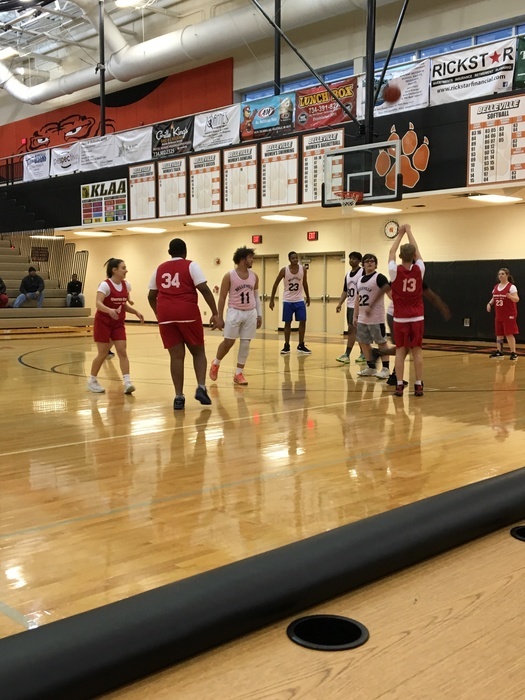 Awesome event yesterday as the KLAA held a Special Olympics Unified Basketball Tournament in which Belleville High School was a part of! Dine to donate! Help BHS win the 2nd round of the Buffalo Wild Wings spirit bracket and earn money for the Senior class. Monday, Feb. 18. See flyer for details. 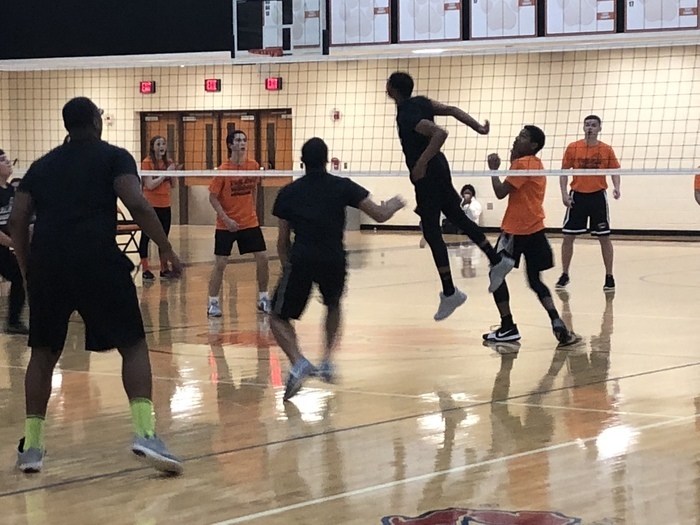 The Tuff Puff volleyball game has been rescheduled for Wednesday, February 20 at 6:30 p.m. in the main gym. Attention BHS: Thursday is Heart Awareness Day, and everyone should wear pink or red. Also, we are still having the bake sale, flower/candy/stuffed animal sale at lunches, and we will have kindness activities during the day and at lunches. More info on morning announcements. Update from StuCo on Kindness Week: Due to the snow day on Tuesday, Wednesday will be Bullying and Breast Cancer Awareness Day. Wear Blue or Pink on Wednesday to show your support and participate in activities during lunches. Belleville/Huron/Flat Rock/Airport Unified Hockey players celebrated Senior night tonight. Thanks for a great season Seniors! Congratulations to Justice Shafer, Nathan Antolin, Blake Williams, and Jaden Rice for advancing as Regional Qualifiers in wrestling today! Congratulations to the Belleville/Huron/Airport/Flat Rock Unified Hockey team for winning the SEHL League Championship! Tuff Puff Volleyball Game! The Class of 2019 and the Class of 2020 will battle, and the winning team will play against the staff! The Game is Wednesday, February 13th, 7 pm - 9 pm. The cost is $5.00 dollars for entrance. Come and experiences this awesome event! Congratulations to the Belleville wrestling team as they won the MHSAA Team Districts this evening! Good luck at Regionals! Congratulations BHS Wrestling Team - District Champions! All basketball games are still being played as scheduled today. Come support the boys at Fordson or the girls at Home vs Fordson. F & JV girls tip at 5:30, V at 7. F boys 3:45, JV 5:15, V 6:45. There’s still time to support the BHS Class of 2019 by eating at the Mongolian Grill on Ford Rd. You have until 9 tonight. BHS teachers & staff will cook up a little food & a lot of laughs at BD's Mongolian Grill Guest Griller Night (Senior Party Fundraiser) on Wednesday, January 30, 5:00 PM - 9:00 PM. Please present the attached flyer and 20% of your total bill will be donated to the Senior Party! Reminder: Monday, 1/28 is a full day of school, with 4th - 6th hour exams in the morning. Students, you will attend your first semester 4th hour for lunch and to get your 2nd semester schedules. Please see the attached photo for the bell schedule for the day. BHS Students - The plan for exams is as follows: Exams for hours 1 - 3 will be Friday morning. (A.M. William D. Ford students do not need to report.) Friday is a half-day, dismissing at 10:52. Exams for hours 4-6 will be on Monday morning. Monday will be a full day of school. Lady Tigers JV and Varsity Basketball beat Franklin at home tonight. Come show your support for the girls this Friday vs Churchill. Belleville Unified Basketball welcomes PCS Unified Basketball! Great game, great fans, great atmosphere! The belleville girls basketball team earned a hard fought victory, 54-51, over Dearborn in overtime tonight. Congratulations to the girls bowling team on their victory over Churchhill yesterday 28-2. Top bowlers for the Lady Tigers were Katherine Dybicki 200, 183 and Sydney Allison 248, 234. Way To Go Tigers!!! It was an amazing two days! So proud of our students and community. Thank you Mrs. Bargardi, Mrs. Testorelli, BHS counselors and everyone else who helped with this valuable event! The Varsity Boys Basketball team beat John Glenn 81-78 in an OT Thriller this evening. Congratulations on the win guys! Belleville New Tech staff and students work with McBride 8th grade students in science class. Students were introduced to Project Based Learning with either a Balloon Boat or Catapult project. Congratulations to the boys and girls varsity bowling teams on defeating Fordson yesterday. The Boys started out strong with team baker games of 203 and 188 taking an early 10 - 0 lead. Leading scorers for the boys in individual games were Shane Tinsley 212, Caleb Benefiel 202,Troy Pratt 209, and Bradley Folks 267. The Fighting Tigers won by the score of 30 – 0. The girls also won by the score of 30 – 0. Leading bowlers for the lady tigers were Brooklyn Keele 166 and 167, Katherine Dybicki 194, and Sydney Allison 224. Way To Go Tigers!!! Belleville Boys Hoops (F, JV, V) all got wins vs Fordson tonight! Nice work guys. John Glenn is next at Home on Friday. On Friday, January 11th we will have assemblies to increase awareness and provide resources for students who struggle with depression. The program is "Do it for Daniel". We will have an evening program for community members on January 10th. See our website for more information. Ms. Sych's practical art class created striking artwork for a deck of cards. Kash, an emotional support dog, visits BHS staff and students to lend some calm to a the hectic holiday season. Kash works with an area orthodontist to calm kids who are nervous about procedures. Belleville Boys Basketball defeats Churchill 74-50. The PBIS team will be selling jolly grams (candy) in the cafeteria December 17th- 20th at all lunches. They will be 50 cents each. They will be distributed on Friday December 21st in 1st hour. Belleville New Tech BioLit classes (Ms. Garland & Ms. Wyborski) present their Farm to Plate project to the community and members of the Wayne County Farm Bureau. Congratulations to Jordan Kelly for signing with Concordia Soccer! Congratulations to the girls bowling team for winning their second straight match in the conference. Way To Go Tigers!!! Dine to donate on Thursday, December 13 at the Applebees on Belleville Rd. Mention the dine to donate and the class of 2019 will receive 15% of the proceeds toward Senior party. Spread seasonal cheer and joy in our community by voting for your favorite BHS coach or teacher to sing during lunch! Your small donation adds up in a big way when we can use it to purchase toys for the kids in our area! Boys Varsity basketball beat Romulus 63-43 to open the season 1-0. Belleville Swimming beats Wyandotte 103-82. Swimmer of the meet was Travis Kruschlin for his 100 yard freestyle. He is looking forward to the Alumni Meet at BHS on 12-15 at 1pm to Swim against all the alumni and Coach Lang! Congrats to the BHS Men’s Swim team on their victory against Wyandotte. Swimmer of the meet was Travis Krushlin. He is excited to swim against the Alumni next weekend. Go Tigers! BHS Student Council is collecting new, unwrapped toys that will be donated to kids in our community during the holiday season. Donations will be accepted through December 14 and can be placed in the donation boxes in the media center. Thank you for helping us help others! Congratulations to RJ Sherwood as he signed with Oakland University to play baseball today. Congratulations to Annabella Sylvestre for signing to Madonna for soccer this evening. Good Luck! Ms. Kummer's engineering class participated in a Skype video call to ask questions of a representative of Solar Roadways, a company that is working on integrating solar panels into roads to achieve safety and ecological benefits. Belleville football will play Saturday, November 17 at 1pm vs Chippewa valley. They game is at Troy Athens high school. Tickets are $7 at the gate. Come cheer on your Tigers to try and get them to Ford Field. Mr. Krumm's World History & Geology class presented their projects about how classic civilizations can give us a greater understanding of our world today. On Wednesday, November 14th the BHS Counselors will be hosting a College Fair 9-11 AM. See the attached flier for more information. Congratulations to the Regional Champion Belleville Tigers Football Team! They defeat West Bloomfield 13-10 and move on to the Semifinals. Former BHS athletes Professional jerseys proudly hang in the athletic hallway. Over 700 BHS students are having pancakes this morning for making the honor roll first marking period - great job TIGERS! Congratulations to Alyssa McClendon as she signed to play softball at Henry Ford this evening! Parent/Teacher Conferences will be held on Wednesday, November 7 (12:00 - 3:00 p.m.) and Thursday, November 8 (12:00 - 3:00 p.m. & 4:00 p.m. - 7:00 p.m.) Hope to see you there! On Wednesday, November 7th, 11 AM -11 PM, Buffalo Wild Wings will donate 20% of your total bill to the class of 2019! Carryout orders are included! Congratulations to the Belleville Football team for winning the schools first ever District Championship! Next up, West Bloomfield in the Regional Championship on Friday November 9, 7pm at BHS. Ticket prices will be $6. Belleville football advances through the Pre-District round with 28-7 win over Dearborn. Come support the team on Friday night, 7pm, at BHS as they take on Monroe for a District Championship. Reminder that admission is $6 for this MHSAA Event. Good Luck Tigers! Come support your Tigers as they take on Dearborn in the Pre-District round of the MHSAA Football Playoffs Friday night at BHS. Game time is 7pm and please note that admission to this MHSAA event is $6. The BHS PBIS team will be selling Boo grams (candy) in the commons on October 25th-30th. Buy some for a friend. They will be sold for $.50 each. The grams will be delivered in 1st hour classes on October 31st. Congratulations to Belleville football for winning the KLAA Championship 32-17 over Brighton! KLAA Championship game for football is set. Belleville will host Brighton on Friday at 7pm after defeating Franklin 56-6. Want to have input into the playlist for the homecoming dance? Add your suggestions into the following form : https://goo.gl/forms/PNqAmBuU77zIziJ12 Remember the final list is subject to staff and DJ approval. 46-0 win for Belleville football. Sets up Division Championship game vs Franklin next Friday at 7pm on Homecoming Night! Come cheer on your Tigers!!! The varsity volleyball team defeated Dearborn in 4 sets last night. Way to go Tigers! The tigers cross country team ran a tough race against Livonia Franklin yesterday. The top men were Brady Beckley and Andy Schweers. For the women, Gracie Overby and Zaria Miller ran 10 second and 17 second Personal bests. Good afternoon BHS families.Tomorrow, October 3rd is count day. Please be sure your student is in attendance. The Senior Parent Meeting will be held at 7 o'clock p.m. tomorrow night in the main auditorium. This Friday October 5th is Picture Re-take Day. Go Tigers! Belleville High School Senior Parent Meeting----Parents please join us for an informational meeting about everything you need to know about your students senior year at Belleville High School. Football punches their playoff ticket with 29-26 win over Fordson. Congrats on the big win! Ms. Duda’s American Sign Language students celebrate Deaf Awareness Week by making t-shirts that spell out “BHS Go Tigers” in sign language. The Belleville Athletics Hall of Fame Wall is up! We are still taking your nominations until Oct. 1 for the 1st class. Forms can be found on the athletic website or in the athletic office of BHS. Belleville football beats Wayne tonight. Sets up big Division showdown vs Fordson next Friday! Come out and show your support. Go Tigers! Varsity Football gets tough Division win on the road vs John Glenn 26-21. Varsity Volleyball earned a hard fought win vs John Glenn tonight! Good Job ladies! Belleville 35 Dearborn 7 at the half. 18-12 JV Football wins over Dearborn. Congrats! Freshmen football took down Dearborn 36-0 tonight. Congratulations to Men's Varsity soccer for beating Wayne 5-0 this evening. Talented Seniors did an amazing job painting their spots for the StuCo fundraiser! Seniors paint their parking spaces as part of a BHS Student Council fundraiser! Final! Belleville 48 Churchill 24. Big Division win. Congrats Tigers! Coach Crowell with Dobbs and Barnett as they are presented their All-America jerseys. Still need to pick up your schedule & Chromebook? 9th & 12th grade band students can pick up them on Thursday, August 30, 8:00 - 10:00 a.m. All other students can pick them up on Thursday, August 20, 12:00 - 2:00 p.m.
Tigers football wins a thriller over Brighton 40-35 on late TD! Congrats! The BHS Boys Golf Free Clinic Scheduled for August 14, 15, and 17 at Harbour Club has been cancelled. We apologize for any inconvenience. Thank you! The Villa Team (Sam Villa, Jack Gray, Jeff Price & Dave LeBlanc) win the 2018 BHS Athletic Golf Outing which was held at Pine View GC last Saturday. Thank you to all who participated. We are grateful to all of our sponsors who helped make the outing a success. Atchinson Ford, Buffalo Wild Wings-Ypsilanti, Krumm Agency, BHS Bands, C.E. Raines Co., JM Engraving, Benitos Pizza-Belleville, Belleville Retired Aquatics, Stephanie Simons, Doc Williams-Family Dentistry, Lakes of Taylor Golf Course, John Cast & Simone Pinter. Let us know your thoughts on changing school colors and mascots for Owen & McBride https://goo.gl/forms/4dhRGubTUpy5E8AP2 Thanks! Congratulations to Janessa Franklin for signing with Adrian College to play basketball! The Belleville High School Annual Education Report is available on our website under the "OUR SCHOOL" tab. Hard copies are available in the main office. Varsity softball lost to Ann Arbor Pioneer 0-5 last night in the first round of MHSAA Districts Highlights - Hailey Clement went 1-3 with a bunt. - Haley Bellingham went 1-3 with an infield single. - Kailee Settles went 1-3 with a single to right field. - Rachelle Frederick pitched 6 complete innings giving up 7 hits, 2 walks, 1 earned run with 2 striking outs. Last night the Varsity Girl's Soccer team ended their season with a 6-1 defeat at Ann Arbor Skyline in round one of the MHSAA Districts. Alyssa Clark scored the only goal for the Tigers, who ended their season with a record of 14-6-1 and 9-0 in the conference. Congratulations to the team for another successful season. Congratulations to Mrs. Lasenby, Mrs. Testorelli, Mr. Tedaldi, Mrs. Rybicki, Mrs. Halliday, Mrs. Small & the Class of 2018 for a spectacular "Night in Paris" at the Bentley for Senior Prom! JV & varsity girls tennis teams take on their friends, family, and community members in the annual tennisathon! Thanks to all who came out on Saturday! Craft Club helped to make prom centerpieces, just one of the many things that made Prom 2018 a success. Thanks to all who helped to make this a special night! Yesterday, the varsity Track and Field team hosted the WWAC League Championship meet. For the men’s team: Placing first, Jalen Gaskin in shot put and discus and Conor Bush in high jump. Finalists were: Cobey Hall and Patrick Lupro in the 100 meter dash, Cobey Hall in the 200 meter dash, Gabriel Hawkins and Kamaree Clark-Lewis in the 400 meter run, Nick Cooley in the 800 meter run, Brady Beckley in the 1600 meter run, and Isaiah Foster and Prince in the 110 and 300 meter hurdles. The 4 by 100 meter relay team with Lupro, Seldon, Harris, and Hall took first place. For the women’s team: Placing first, Tatiyana Foley in shot put, Shacylah Smith in discus and Jiyahna Price in high jump. Finalists were: Paige McGowan, Tyana Thompson, and Klara Smith in the 100 meter dash, London Lee and Klara Smith in the 200 meter dash, Niya Thompson in the 400 meter run, Nyeem Mayfield in the 100 meter hurdles, and Araynah Dover and Ciera Wells in long jump. The 4 by 200 meter relay with Smith, Thompson, Mayfield, and Lee placed 3rd, the 4 by 400 meter relay with Myracle Welch, Niya Thompson, Jiyahna Price, and London Lee took 4th place and the 4 by 100 meter relay with London Lee, Tyana Thompson, Klara Smith, and Paige McGowan took first place in the championship meet. Varsity softball wins at Livonia Franklin yesterday in a doubleheader 16-1 & 12-7. Highlights - Hailey Clement went 7-9 with 6 singles and a double - Alyssa McClendon went 6-7 with a 4 singles and two doubles. - Haley Bellingham went 5-9 with 4 singles and a double. - Madison Mikulski & Mikayla Demyan are tied at 11 home runs each setting new school single season record. The Varsity Girl's Soccer team completed their third straight undefeated league season and won their fourth consecutive league title with a come from behind 6-3 victory at Garden City. Senior co-captain Madison Marshall led the way with four goals and Lauren Marshall added two as the Tigers raised their overall record to 14 wins, 5 losses, and 1 tie. The Varsity Girl's Soccer team celebrated Senior Night with a resounding 10-2 victory over Redford Union last night. The win raised the teams league record to a prefect 8-0 and clinched at least a share of a fourth consecutive League Championship. Madison Marshall and Lauren Marshall both scored three goals, and Alyssa Clark, Katie Byrd, Michelle Eau Claire, and Emma Rafferty each added one for the Tigers. Varsity softball wins big over Summit Academy 18-0 last night Highlights - Hailey Clement went 3-4 with 2 doubles and a triple. - Haley Bellingham went 3-3 with 3 singles. - Alyssa McClendon & Allie Matheny both went 2-3 with a single and a double. - Mycah Smith was 1-1 with a triple. - Madison Mikulski went 2-2 with 2 home runs. Rachelle Frederick and Kenzie Kennedy combined for a no-hitter. Congratulations to the Boys Golf Team with wins against Crestwood, Redford Union and Annapolis last night. Nicholas Cooley-Sarna was the low scorer. The Plymouth Wildcats prove to be too much for the Tigers last night at the MHSAA Lacrosse District game. Our Tigers suffered a 16-4 loss. Jay Rupnow made 18 saves, Caleb Forga and Tyler McDermott each had 2 goals for the Tigers. Congratulations to the lacrosse team on a great season. Congratulations to Jay Rupnow on signing to the University of Michigan to play Lacrosse. On Friday, the varsity Track and Field team competed in the MHSAA Regional meet at Saline HS. For the men’s team: Placing first, Jalen Gaskin in shot put and discus and Conor Bush in high jump. Finalists were: Cobey Hall, Patrick Lupro, and Andre Seldon in the 100 meter dash, Dylan Harris in the 200 meter dash, Gabriel Hawkins and Jamari Buddin in the 400 meter run, and Isaiah Foster in the 110 meter hurdles. The 4 by 100 meter relay team with Lupro, Seldon, Harris, and Hall placed 4th and the 4 by 200 meter relay team with Harris, Seldon, Merriweather, and Hall placed 5th. For the women’s team: Tatiyana Foley placed 5th in shot put and Shacylah Smith placed 6th in discus. Paige McGowan was the finalist for in the 100 meter dash. The 4 by 100 meter relay with London Lee, Tyana Thompson, Klara Smith, and Paige McGowan placed 7th and their 4 by 200 meter relay took 6th place. The 4 by 800 meter relay with Nya Thomas, Ashanty Spencer, Alexis Mattingly, and Myracle Welch placed 7th. Varsity softball went 1 for 3 this weekend - Haley Bellingham went 3-6 with 3 singles. - Madison Mikulski went 5-8 with a single, double and 3 home run. - Mikayla Demyan went 3-8 with a single, double and 1 home run. - Alyssa McClendon & Rachelle Frederick both had 1 home run each. - Mackenzie Kennedy got the win against Marine City allowing 5 hits, 2 walks and had 2 strikes outs. A.P. 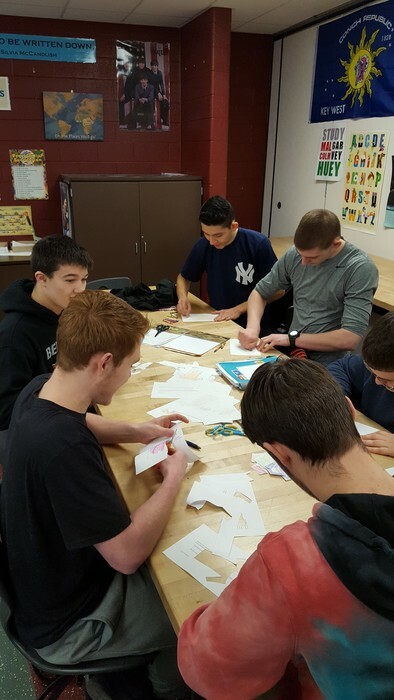 World History students in Ms. Kennedy's class recently participated in a simulation involving working in a factory during the time of the Industrial Revolution. Seniors: Updated information on painting of BHS class of 2018 parking spots. Due to the threat of rain on Saturday, there will be paint available on Friday, May 18th from 3:00 p.m. till 7:30 p.m. please be sure to bring your paint brushes and a paint pan. Varsity softball defeated Dearborn both games in our double header yesterday Highlights game 1 win 15-1 - Haley Bellingham went 1-2 with a single and 2 RBI's. - Madison Mikulski went 3-3 with a single, 2 home runs and 6 RBI's. - Samantha Jernigan went 1-2 with a single. - Alyssa McClendon went 2-3 with a double, a home run and 3 RBI's. - Allie Matheny went 2-3 with 2 singles. - Rachelle Frederick pitched a 2 hitter allowing 1 run, 1 walk and had 6 strikeouts. Highlights game 2 win 19-7 - Hailey Clement went 2-4 with 2 singles. - Madison Mikulski went 2-2 with a double, a home run and 2 RBI's. - Mikayla Demyan went 2-2 with a single, a home run and 4 RBI's. - Alyssa McClendon went 2-3 with a single, a home run and 5 RBI's. - Allie Matheny went 2-2 with 2 singles. - Katherine Dybicki went 2-3 with a single and a double. - Mycah Smith went 2-4 with 2 singles. - Haley Bellingham and Kailee Settles split game 2 allowing a combined 7 runs, 0 walks, and had 3 strikeouts. The JV Boy Baseball team split a double header with Dearborn yesterday. The JV Tigers won the opener 9-4 however 14-6 in the night cap. Caleb Overby and Nick Rafferty has an exceptional defensive game. Yesterday the Girl's Varsity Soccer team traveled to Redford Thurston and returned with a 9-0 victory. Emma Rafferty and Ashlynd Griffith scored twice, and Madison Marshall, Bella Sylvestre, Lauren Marshall, Michelle Eau Claire, and A'Nya Griffin all scored once as the Tigers remained undefeated in league play. 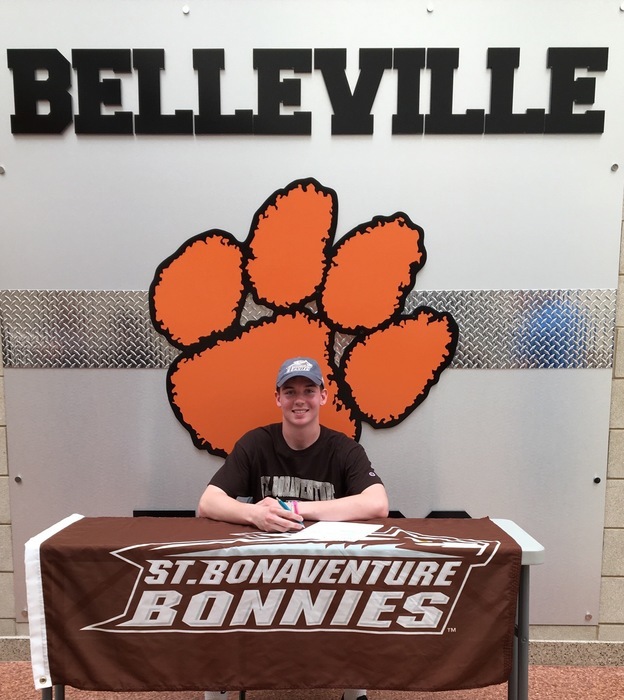 Congratulations to Caleb Forga for signing with St. Bonaventure for Lacrosse! Ms. Kennedy's class recently extended their exploration of topics in their African American Studies class by visiting the Charles H. Wright Museum of African American History in Detroit. Congratulations to Devin Alverson on signing to Siena Heights for basketball! Yesterday, the Belleville Track and Field team went against Dearborn, Fordson, and Romulus. For the men’s team: Placing first, Jalen Gaskin in shot put, Connor Bush in high jump, Isaiah Foster in the 100 meter hurdles, Cobey Hall in the 100 meter dash, Deion Burks, Kaevon Merriweather, Jalen Hunt, and Dylan Harris in the 4 by 100 meter relay. Foster in the 300 meter hurdles, Harris in the 200 meter dash, and the 4 by 400 meter relay. For the women’s team: Placing first, Tatiyana Foley in shot put, Shacylah Smith in discus, Ji Price in high jump, Nyeem Mayfield in the 100 meter hurdles. Klara Smith, Tyana Thompson, London Lee, and Amara Wafer in the 4 by 200 meter relay. Klara Smith in the 200 meter dash. Smith, Thompson, Lee, and Paige McGowan in the 4 by 100 meter relay. Amara Wafer, Niya Thompson, London Lee, and Ji Price in the 4 by 400 meter relay. Varsity softball lost both games to Livonia Stevenson, 2-5 & 4-5 yesterday Game 1 - Hailey Clement went 1-4 with a triple and 2 RBI's. - Haley Bellingham and Alyssa McClendon both went 1-3 with a single. - Madison Mikulski went 1-4 with a single. Game 2 - Hailey Clement went 1-4 with a triple. - Madison Mikulski went 2-3 with a single & a double with one RBI. - Mikayla Demyan went 1-4 with a double and 1 RBI. - Alyssa McClendon went 1-3 with a single. - Samantha Jernigan went 1-2 with a triple. - Kailee Settles went 1-2 with a single and 1 RBI. - Rachelle Frederick went 1-4 with a double and 1 RBI. Yesterday Varsity baseball played Blissfield and came home with the win, 4 to 2. Senior Josh Anderson was very effective on the mound, allowing only 4 hits and no walks, while going 3 for 4 from the plate. Cam McKiddie got the save with 2 strikeouts in 3 innings. He also went 1 for 2 with a walk and 2 RBIs. Great job tigers! JV Baseball Tigers split the series with Garden City yesterday winning 8-1 after falling 4-2 on Monday. Belleville was crushing the ball notching 11 hits with Brad Folks, Austin Folks, Joe Trigg and Mathew Marek each doubling. Sam Robinson also logged a triple. Trigg pitched the JV Tigers to victory. He surrendered one run on three hits over three innings, striking out four. The varsity softball team lost a tough one to Garden City yesterday 2-6 - Hailey Clement went 2-4 with a single and a triple with 1 RBI. - Haley Bellingham went 1-4 with a single and 1 RBI. - Madison Mikulski went 1-4 with a single. - Mikayla Demyan, Alyssa McClendon & Kailee Settles went 1-3 with each getting a single. - Rachelle Frederick pitched. Gave up 8 hits, 1 walk, 1 hit by pitch, 3 strikes outs and only 1 earned run. The girl's varsity soccer team defeated Clarenceville yesterday by a score of 10 to 0. Senior captain Madison Marshall scored 4 goals, Shawn Broadhust added 2, and Alyssa Clark, Michelle EauClaire, Gabby DeLibera, and Olivia Newman each added one, as the first place Tigers improved their league record to a perfect 5 wins and 0 losses. Varsity Lacrosse defeated Ann Arbor Huron 11-2 last night with goals from Noah Copeland, Connor Mann, Caleb Forga, Nate Lazar, Will Confere, and Alec Emerson. Congratulations to Allison Dilts on signing to Alma College for Swim and Dive! Mrs. Duda’s students help each other to record teacher appreciation videos in American Sign Language. They are captioning the videos, too! The Belleville Women's 4X400 team flexes their muscles after defeating Garden City. I'd like to thank the businesses that make our yearbook possible each year! Without your support, producing our yearbook wouldn't be possible. Please support these businesses, as they support us! Congratulations to the boys track team for taking 2nd place at the Woodhaven Invitational today and to the girls for taking 3rd place. Keep up the good work! The Genocide Symposium, presented by BHS World History classes today, was a learning experience for participants and attendees alike. The Belleville Athletic Department Golf Outing is set for June 9 at Pineview Golf Course. Please visit the athletic webpage or stop in the BHS athletic office for details! Class of 2019! Order your Senior Status shirt now! Shirts can be ordered for $15 through April 27 from Mr. Tedaldi or Mrs. Rybicki. You can also order them at lunch on Monday, April 23rd. More opportunities to see the BHS musical "Into the Woods!" Come see the amazing performance and set! Friday, April 20 - 7:00 p.m., Saturday, April 21 - 2:00 p.m. & Saturday, April 21 - 7:00 p.m.
Congratulations to Gabe Brown on being named to the Detroit Free Press All-State Team and to Davion Williams, 2nd Team. Both were also named First Team All-West. Welcome Kristen Slaughter to the BHS Counseling team! She will be serving students with the last names K-Q. Attention Senior Parents...tomorrow is the last day to purchase Senior Prom Tickets and Senior Class T-shirts. Prom is $65.00 per guest and Class T-Shirt are $15.00. Tickets can be purchase online through Payschools and during all lunches on 4/13/2018. If you have any questions or concerns please email Mrs. Lasenby at flasenby@vanburenschools.net. Belleville 1- 0 Ann Arbor Pioneer Varsity Baseball gets their first home win against Pioneer. They finish with a walk off single from Nate Boyar, who threw out 3 baserunners from behind the plate. Belleville High School Parents: There will be a Tiger Parent Meeting tonight, Wednesday, March 28th, at 6:00 p.m. in the BHS Media Center and a Senior Parent Meeting at 7:00 p.m. in the BHS Commons. Parents please read the link found on the BHS website for complete information on our Spring testing schedule. Staff vs. Seniors - Staff wins in a close one! The winner of this game plays the staff! The Belleville High School Science Olympiad team battled their way through the Wayne-Monroe Regional Tournament. They walked away with medals in 10 events! GO TIGERS! 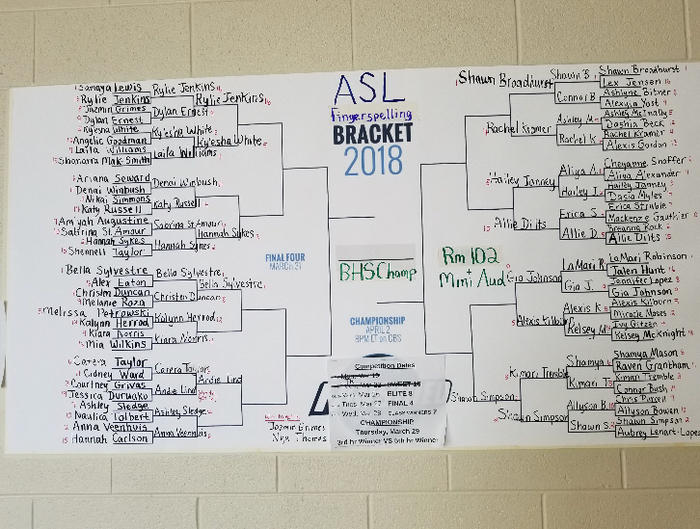 Mrs. Duda-Osborne’s American Sign Language classes have their own version of March Madness—an ASL bracket competition! Students in Mlle. Steward's French III class help their classmates navigate around the room using what they learned in their unit on directions! Team 6615, The Belle-Voxel-Bots, prepare for the FIRST Robotics Competition. In its inaugural year at BHS, it promises to be an exciting competition and showcase of STEAM in action! Belleville New Tech Bio/Lit students present their Block Out Cancer project, which involved a partnership with the University of Michigan. Belleville Tigers JV defeated WL Central 15-0 on Wednesday. Sam Robinson, Noah Flaig and Brad Folks combined to pitch a shutout in the JV Tigers first win of 2018. Belleville Baseball wins first game of season against walled lake central in a full team effort. Mason Ampe pitched 3 innings with 5 strikeouts, and Gavin Karolak hit 2 doubles and 1 RBI. Cogratulations to Mackenzie Kennedy on signing with Cuyahoga Community College to play softball. Belleville Varsity Lacrosse was victorious with a 17-1 win in the season opener against Pinckney! Belleville loses heartbreaker at the buzzer to Novi 73-75. Great run and season. Warm ups at Calihan Hall! Good Luck Tigers! Pre-Sale of Quarterfinals tickets for boys basketball will take place in the Athletic Office at the high school on Monday and Tuesday during school hours. Tickets $6. Parking at event will be $5. Belleville boys basketball defeats Wayne 66-54 to win the Regional Championship! Congrats guys!! All Spring Sports tryouts/practices are cancelled for today. Congratulations to the boys basketball team for their back-to-back-to-back District Championships! Girls hoops in consecutive Sweet 16s with win over Allen Park. Advance to Regional Finals vs Wayne on Thursday, 7pm at Wyandotte HS. Belleville boys basketball wins tonights District semifinal over Ypsi to advance to Fridays final for a chance to 3-peat as Champions. Game will be played at Lincoln at 7pm vs Saline. 3-peat!! Girls Basketball gets it done again winning 3 consecutive District Championships! Great job ladies! Good luck to Blake Williams and Jaden Rice as they compete in the MHSAA State Wrestling competiton! The prom guest pass application deadline has been extended to Monday, March 5 at the end of the school day due today's school cancellation. The Girls Basketball District Championship game is still on tonight. Tip-off is 7pm at Bedford HS. Come support the girls as they take on Monroe to try to make it 3 District Championships in a row! Jazz Band’s Annual Spaghetti dinner is this Saturday, March 3, from 5 p.m. - 8 p.m. in the BHS Commons. Lady Tigers Basketball wins a thriller @Bedford. Advance to District Final vs Monroe on Friday at 7pm. Good Luck Girls! Congratulations to the Unified Basketball team on their win yesterday. Proud of the awesome sportsmanship! GO TIGERS! Belleville Mens Basketball Senior boys take a picture with Coach Trumpour before taking the floor in their final home game tonight vs Robichaud. Congratulations to Davion Williams and Gabe Brown for being named Esmark All-Americans for basketball this season! Graduation & Prom Expo today at BHS until 2 p.m. Many vendors and great raffle prizes. $3 admission. Belleville men’s swim team celebrates with their coaches after capturing the WWAC Championship this evening. Great job Tigers! Congrats once again to the boys and girls basketball programs for sweeping Woodhaven last night. BHS won 1st round in the Buffalo Wild Wings Spirit Bracket Challenge! Please support BHS in the 2nd round on Wed., Feb. 21 at Bdubs in Ypsi. 20% of the proceeds goes to the BHS Senior Class & StuCo. Belleville boys and girls basketball secure the season sweep of Romulus tonight (ALL LEVELS). The win also locks up the WWAC Championship for the boys! Congrats to both teams! Ms. Duda’s Health 2 students interpret their Braille Valentines. Boys swim gets close win over Dearborn 92-91 last night! Great job guys! Congratulations to the boys and girls Varsity basketball teams for their victories over Robichaud (girls) and Thurston (boys) last night. Congratulations to Jack Haase for breaking a 39 year old varsity record in the 500 freestyle. This time also qualifies him for the MHSAA Division 1 state meet. Congratulations to the Boys and Girls bowling teams for defeating Dearborn yesterday at Merribowl Lanes. Just a reminder that the Belleville High School Cominghome Dance scheduled for this evening, 2/10/18, is cancelled. Belleville Mens Swim takes down Edsel Ford 97-89 tonight. Great job Tigers! Boys and Girls Basketball games for Friday, February 9 vs Fordson have been cancelled. Staff before and after their sweet Tuff Puff victory! Pictured are 11 of the 13 Belleville football players who have committed to play at the next level. Congratulations to all and good luck! Congrats to the boys and girls Varsity basketball teams for picking up wins over Dearborn yesterday. Congratulations to the varsity boys and girls bowling teams for beating Romulus yesterday at Thunderbowl Lanes. Tuff Puff Volleyball - Juniors play Seniors and winner plays BHS Staff! Who will be Tuff Puff champs? Find out on Wednesday, Feb. 7 from 6:30 - 8:30. Admission is $5 & concessions will be available. Upcoming Spirit Week Days: Wednesday - Class T-shirt Day, Thursday - America Day (wear red, white, and blue) and Friday - Orange & Black Day! Go Tigers! BHS Coming Home Dance is Saturday, February 10, 7:00 p.m. - 10:30 p.m. (Doors close at 8:30.) Tickets are $10 and will be sold during all lunches on Monday, February 5 - Thursday, February 8. BHS Coming Home is Mardi Gras-themed! Monday: Wear bright colors! Seniors - Blue, Juniors - Green, Sophomores - Purple, Freshmen - Red. Don't forget those Mardi Gras beads! Congratulations to the Belleville Wrestling team as they won the WWAC Championship today!! Good luck in Districts! Principals and teachers came out to grill at Mongolian BBQ, and many VBPS families came out to eat! Thank you for for the community effort to raise money for the BHS Senior Party! Wrestlers get Ws over Annapolis and Garden City on Alumni Night. Great to see all the alumns at the match to support Belleville. Thank you everyone! Mr. Musser & Mr. Napthen are guest grillers at the Senior Party fundraiser! Great night for the Tigers! Clean sweep of Romulus for girls and boys basketball programs (sub-varsity & Varsity)! End of First Semester Information Final Exams for 1st, 2nd, and 3rd hours Thursday, January 25th (1/2 day) Final Exams for 4th, 5th, and 6th hours Friday, January 26th (1/2 day) ***Students must be on time for ALL exams! *** On Monday, January 29th, all students will go to their first semester 1st hour classes. Teachers will distribute second semester schedules. Students with new 1st hour classes will proceed to new classroom. Congratulations to Davion Williams for scoring his 1000th career point tonight! Boys and Girls Varsity Basketball teams both get victories over Dearborn tonight. Congratulations! Congratulations to Derrick Lotharp for being selected as an official winner of the 2018 Disney Dreamers Academy Essay Contest! This contest is sponsored by Family Fued host, Steve Harvey, and ESSENCE Magazine. Derrick will receive an all-expense paid trip to Walt Disney World Resort in Orlando, and receive hands-on training from Steve Harvey and other celebrity presenters on how to Dream Big and Discover the Possibilities. Again, congratulations Derrick on this monumental accomplishment!! Interested in ROTC? Join our military club and gain insight. Congratulations to the boys and girls varsity bowling teams on their victory over Crestwood yesterday. Boys won by the score of 21-9. The Lady Tigers also won by the score of 18-12. Boys Varsity Basketball get road win, 81-34, on the road vs Crestwood this evening. Great comeback win for girls Varsity Basketball over Crestwood 53-46 tonight! Congratulations to Chandler Bradley, Sierra Gurney, Christopher Zaharie and Aliya Meeks for winning the design competition for the STEAM Showcase being held at BHS on 2/3/18. BHS students and athletes making us proud at Rawsonville. These young men have taken on the role of mentor to some of our youth. The last day to turn in a Senior Picture is 1.12.18. BHS Yearbook is offering a free professional senior picture this Thursday 1.11.18. ID pictures will NOT be used. See Mr. Musser with questions. Interested in taking sign language as an elective? Stop by and see Ms. Duda-Osborne in room 102 or email her at sosborne@vanburenschools.net. Congratulations to early signees fot football: Patrick Lupro (WMU), Kmare Carey (WMU), & Davion Williams (MSU)!! Mr. Mackie's AP Biology class was the one that donated the most to the "Force for Change" student council food drive. The class was presented with a gift certificate to see the latest Star Wars movie! Belleville/New Boston Huron Unified Hockey for tonight, Dec. 13, has just been cancelled. Coaches are working to reschedule. Thank you. All athletic activities (including practices), with the exception of New Boston Huron/Belleville Unified Hockey have been cancelled today, December 13 due to weather. Thank you! The National Honor Society hosted a Blood Drive on December 12th! THANK YOU TO EVERYONE WHO GAVE BLOOD!!! YOU'RE THE BEST!! BHS career and College Fair for this evening is postponed. Also all after school activities are cancelled. Support Senior Party and skip cooking on a busy weeknight by going to Wendy’s on Tuesday from 5 - 8 p.m. for a “dine to donate@ event! BHS Men’s swim team beat Churchill 94-92. Great swims had by all. Special congratulations to Freshmen Jack Haase for breaking the 9th and 10th grade record of the 200 Free with a 1:49.78 and 500 Free with a 5:05.23. BHS Bowling teams win 23-7 over Annapolis. Girls top bowlers: Brook Petty 176, Katherine Dybicki 183. Boys were: Joshua Parent 203, Bradley Folks 257, and Kyle Dybicki 237. Way To Go Tigers!!! BNT students presenting mini-PBL activities to McBride 8th grade science classes. Early packet pick-up for the Jingle Bell Run is today, Wednesday, November 29th at Belleville High School from 4-7pm. Enter through the doors near the flag pole. If you are not registered, You can register on-site (cash or check only). Varsity Lady Tigers Basketball opened the season with a blowout win over Ypsilanti, 59-13. Next game is Friday, Dec. 1, 7pm at Saline HS. JV girls hoops wins a thriller vs Ypsi to start 1-0! The 2017-18 Girls Basketball season has officially started! Students in gym class with Ms. Hanaka and Mr. Phillips were challenged by the National Guard to up their physical fitness game! Congratulations to Katelyn Sherwood for signing to play basketball for Wayne State University today! Congratulations to Gabe Brown on his signing to Michigan State University today for basketball. BHS staff members having a great day of professional development! Check out the November edition of BHS Connect for upcoming news & events http://5il.co/278c. Volleyball beats Ypsi in 3 straight games to advance to round 2 of Districts. They play @ Bedford vs Monroe at 6:30pm on Wednesday, Nov. 1. Belleville Volleyball begins District play tonight at Bedford vs Ypsi. Good Luck! WWAC Swim/Dive League meet pre-lims have begun. Good Luck Ladies. Finals will begin 6pm Wednesday, Nov. 1 @BHS. Halloween Costume Contest on October 31st! Belleville beats Salem 17-7 on a rainy night in the Pre-District round of the Playoffs. District Championship will be played at BHS on Friday, Nov. 3 vs Canton at 7pm. Belleville Varsity Volleyball gets Win over Garden City on Senior Night. Congratulations Ladies! Congratulations to Chandler Bradley for winning the Jingle Bell Run logo design contest. Out of over 100 logos submitted, her design was chosen by the Van Buren Public Schools Education Foundation! Playoff Football: Belleville vs Salem on Friday, Oct. 27 at BHS. Game time 7pm. Gates open at 6pm. Come support our Tigers! Seniors: Please take the prom survey https://goo.gl/1Knp5a and attend the senior meeting this week on Wednesday after school! It's your class, so make your voice heard! Belleville football erases 21-0 deficit to beat Bedford 27-24 in overtime to go 9-0 in Regular Season. Tune in to the selection show on Fox Sports at 7pm Sunday to find out first playoff opponent. Students, if you are missing your MiStar login, please stop by the media center for help. BHS is hosting many college visits this week. See the events list or your counselor for more information. No Varsity football this Friday. Belleville gets forfeit win vs Annapolis. Record now 8-0 with Bedford next week. Freshmen football earns 18-0 win over Dearborn tonight. BHS volleyball with the win in 3 straight tonight vs Annapolis. Seniors vs. Juniors Powder Puff football game! Wednesday, Oct. 11, 7:00 - 8:30 p.m. Gate and concessions open at 6:00 p.m. and admission is $5.00 at the gate! 69-0 win for Varsity Football over Garden City on Homecoming night. Congratulations! School spirit on display - BHS Homecoming pep assembly. GO TIGERS! Congratulations to Mr. Musser and BHS Yearbook Students for winning the Walsworth Gallery of Excellence award for our 2017 yearbook! Black and orange day success. I love the Tiger spirit. Huge comeback by Varsity Volleyball to get the win over Edsel Ford tonight. Down 2 games to 0, they rallied to win the next 3! Great Win! Kathleen Klein from Waste Management visited Ms. Garland's New Tech Ecology class to help students explore engineering design, career opportunities, and the importance of reducing our waste output. Big step towards League Championship for football tonight with 35-7 win over Fordson! Congratulations to the BHS 2017 Homecoming Court! Belleville JV football wins 18-0 vs Fordson! Girls Varsity Swim got the W tonight over Garden City. Congrats Ladies! Congrats to Freshmen football earning a hard fought 12-8 victory over Fordson tonight! The Humane Society visited New Tech BioLit classes as part of the Human Impacts and Populations project to share the importance of making decisions and taking action as responsible world citizens. Yearbooks are on sale now at www.yearbookforever.com. Get your copy today before the price increases in October! BHS Varsity Football player Patrick Lupro makes time for a fan on Elementary Night. Great tunout at tonight's Orange Out/Elementary Night/Senior Night football game! Thanks to everyone for attending and helping our Tigers to a 58-0 victory! Congratulations to these BHS Seniors - Alexandria Long, Hannah Baynesan, and Davis Mears on their Commended Student status in the National Merit Scholarship Competition! Show your Tiger Pride! Wear orange to Friday's home football game! We are proud to announce that Nina Hardy and Alyssa Jeng are Semifinalists in the 2018 National Merit Scholarship Program! BNT staff at weekly meeting. Mr Tedaldi, science teacher, using innovative methods for students to record needed data during lab work. 62-0 football final. Next Friday, September 22 is a home game at 7:00 vs Dearborn. The game is an "Orange Out" so wear your orange! 28-0 lead at halftime for Tigers Football vs Crestwood. Belleville Football leads Crestwood 21-0 with 6:41 to go in first half. BNT welcome assembly with past graduates and current students talking about experiences and opportunities. Start to another exciting school year. Come see the Belleville High School Marching Band host their 25th Annual Band Review. Tickets are $5.00, and children under 12 are free. The gates open at 5:45 PM and the show kicks off at 6:30 PM. Sophomore students teaching Freshmen about Agency (Developing a growth mindset and taking ownership of your learning). The presentations have begun. Senior Capstone students discussing Diversity and Beliefs and how we have civil conversations while on opposite sides of current issues. The students are generating powerful conversations. 53-0 over Edsel Ford tonight! Good win for Tigers football! 19-0 lead for Belleville Varsity Football over Edsel Ford at the Half. Tigers up 12-0 end of 1st quarter vs Edsel Ford. First Friday of the school year. Students and teachers are off to a great start. Lots of black and orange in the hallways and school pride on display. Day two is off to a great start. Open house is this evening from 5-7. Hope to see you there. Great first day at BHS. It was awesome to see all the returning, and new, students and their smiling faces. Student Council starts a new tradition - painting Senior parking spaces! Tigers Football moves to 2-0 on season with 55-6 victory over Redford Union. Next up, Edsel Ford @ Edsel Ford, 7:00 Sept. 8. Home Varsity Football vs Redford Union Thursday August 31 at 7pm. Come support your Tigers! Come support our Varsity Football team as they take on the Bulldogs of Brighton in the Battle at the Big House 2 at 7:00pm tonight! Good Luck Tigers!! Congratulations to Kyler McNulty on signing for Lacrosse at Siena Heights in 2018!